Peter Speight Halfpipe crash at Sierra Nevada World Cup 2013 from peter speight on Vimeo. Cork 9 in practice. Photographer: Nick Atkins. With bad weather I put down a solid, simple first run to ensure podium. I then really wanted to put down my World Cup run in the comp to show everyone the level I had got to this season so on my second run, dropping last and with the crowd hyped up, I decided to go all out. I landed my back to back 9s but then lost speed going into my 3rd hit. I just had fun for the rest of the run and popped a big straight air out the bottom of the pipe for the spectators. It ended up being a really fun comp and I was happy to come away with 2nd behind Murray Buchan who put down a really good run despite the slow conditions and to end the season with a podium for the second year running. 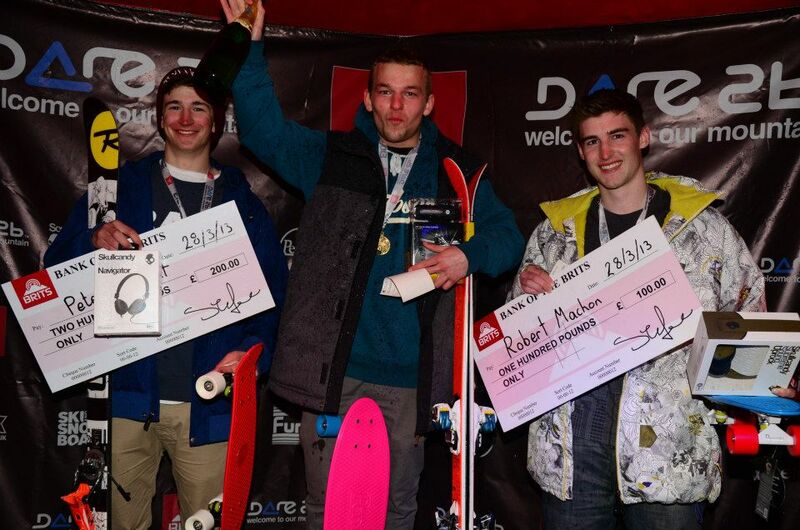 I was also really happy for my mate Rob whose skiing over the years finally payed off with 3rd place! Lads on the podium. Shout out to James Webb for MCing all week. Photographer: Nick Atkins. in Spain so it is time to head home and rest up in time for the summer, during which I plan to go to Whistler and then New Zealand! Thanks for reading and stay tuned!